Learn how to mod a Yomega Dash or Yomega Maverick to make it unresponsive. Yomega Dash / Maverick Unresponsive Mod Yoyo TrickIn this video I am going to teach you how to take your Yomega Dash, as you can see, and turn it into an unresponsive yoyo. Now these yoyos normally come very responsive, they have a very aggressive response system, so I am going to show you how to take that out and replace it with silicone so you can make it into an unresponsive yoyo. The same mod will work for a Yomega Maverick as well, because the yoyos are so similar. So, what you will need for this is of course your yoyo, you will need a clean bearing, you will also want a small screw driver, or something to use to get the old response system out, as well as your flowable silicone. Once you have all of that you are ready to go. 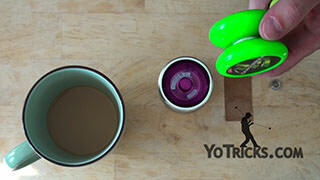 The yoyo, all of these – the silicone, the bearing, and the yoyo – you can get those as a kit, on YoTricks.com if you want to do this from scratch. First of all, you want to take your yoyo apart. You’ve got the extra bolt here, so that will just unscrew. You can just set that off to the side, you will not need that for this mod. You can take the old bearing right out, usually these come out very easily. You won’t be needing that again. You can try to clean the old bearing, but in my experience Yomega bearings do not clean up very well, usually they come out playing very gritty. If you can find a way to clean it then you would not need the clean bearing that comes in the kit. We have found that it is easier to just swap the bearing out. If you look at the yoyo, what you are going to see is that you’ve got your silver spacer here, and then there is this blue material in here that is kind of rubbery, that is the old response system. So we are going to use our screw driver to just take that out. You can just get right in there and kind of pry it free. You might find that it is a little bit easier to just get the spacer out first. As you are doing this you may be concerned that you are going to scrape the yoyo up a little bit. If you are not careful you will be scraping the inside of this anodizing right here. That is not a big deal because that has nothing to do with how the yoyo plays. You do want to make sure to keep the post where the bearing sits from being scratched, because that will affect how it plays. Once you get the spacer out you will want to remove this little rubber piece here, and that should come right out, once the spacer is gone. You won’t need this again; just set this off to the side. We are going to take this spacer and use it in just a minute. I’ll explain what we are going to do first. If you look at the yoyo you can see that there is a deeper portion, and then there is this flat area right here. The flat area is where the spacer sits. So what we are going to do is take our silicone and fill up this bottom area, but not all the way up to where the spacer is going to sit on this flat platform here. We are going to put the spacer on it, and then we are going to fill it up the rest of the way. That means that the spacer will fit in perfectly, but the silicone will come up around it and will actually hold it in place. It is a pretty nice mod, and it works pretty great. Again, just get your flowable silicone, you are going to take your yoyo right here. You can be pretty generous with this stuff, because it will even itself out. Just start by pouring it around the bottom. Like I said, you do not have to be too awfully careful, just try to keep it from getting on that top platform where the spacer is going to sit. You do not need to fill it all the way up because in the second part we are going to get the rest of it. So if you take a look in there, you can hardly see it because it is reflective, but I have not got the silicone on top of that platform. No I am going to take the spacer, and set it right on there. Make sure you put it in the right direction so that it holds the bearing properly. Now that we have got it in it is sitting in there perfectly, so we will just take the silicone and we are going to bring it in all the way around. You want to bring it in so that it is almost up to the top of where the spacer is, but not all the way up the the level of the spacer. Part of the reason we are replacing this blue response system with the silicone is so that the silicone can sit a little bit lower. Like I said, we are going to fill it up so that when it hardens it will grab the spacer and hold it in place, but we are not going to fill it all the way up because then it is going to be just like having the old response system in. You want to be a little bit more careful this time. It is really not that big a deal because the silicone will flatten itself out. Just kind of work your way all the way around. The nice thing about the flowable silicone is if you do it a little bit uneven in one place, or if you don’t put quite enough in you can just go back around the other way. As long as it dries on a level surface then it will work itself out no problem. The higher you bring the silicone, the tighter your binds are going to be, but if you make it too high you might have a hard time making it perfectly unresponsive. So it is kind of up to you as far as that goes. We’ll take a look. We’ll see. It is kind of hard to tell how high I filled it up, but once it hardens it is going to be grabbing onto that spacer, so that spacer won’t be coming back out again. So you just do the same thing to the other side. Once you are done you can take your bearing and you can put it right back in. Put it back together as long as the bearing is clean then it is going to be playing perfectly unresponsive. Just like any yoyo, this bearing comes perfectly clean. You may want to consider putting in a few really tiny drops – maybe just one on each side – of thin lube, and that will preserve the life of the bearing, and it should help it to stay unresponsive. Give that about 24 hours to dry once you have done both sides. Put the bearing in, take your bolt and just put the whole thing back together, and you will be good to go. 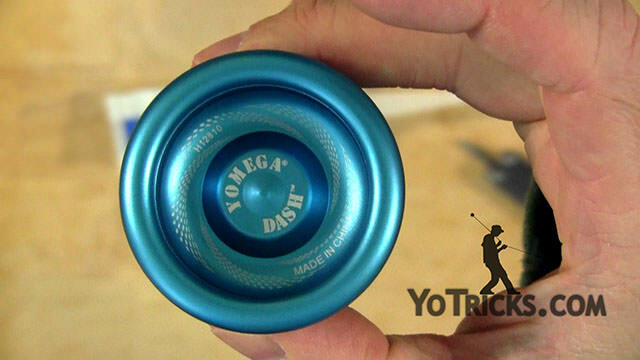 That is how you mod a Yomega Dash or a Yomega Maverick into an unresponsive yoyo.